Adding to our range of bottom bars, we now offer round aluminium bottom bar. 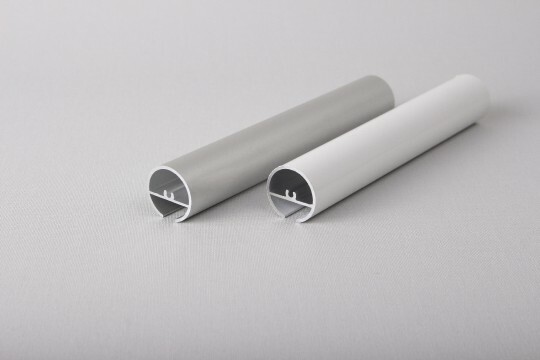 In a move that expands our customer’s level of choice, we provide 911825S/W Round Aluminium Bottom Bars in silver or white as an option on any roller blind. Round aluminium bottom bar from Yewdale is a great alternative to tear drop bottom bar as it provides an eye-catching, strong and neat solution. It is completely round, with only a gap in the top to hold the fabric. There is no channel running through the underside of the bottom bar, which is often found with some other round bottom bars. End caps are supplied with screws to hold them securely in place, making the end caps more robust and less likely to separate from the bottom bar. Shop through our Online Ordering Portal for round aluminium bottom bar, or get in touch with your Business Development Executive to get your online ordering account set up today.